"Thank you for letting us look after your cat." Knuston Boarding Cattery is to be found in the rural location of Knuston on the B569 between Irchester and Rushden. 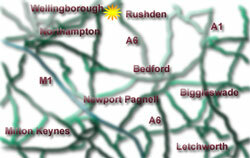 Approximately 4 miles from Wellingborough and 12 miles from Bedford, Kettering and Northampton. During November, December January and February we are only open for delivery and collection 10.00-12.00am. A door to door collection and delivery service is available. In exceptional circumstances reception or collection at other times can be arranged by special appointment. Don't forget to bring your cat's vaccination certificate and that you are welcome to bring your cat's favourite toys, bed or sleeping basket and any bedding with which the cat is familiar to facilitate settling in. The Knuston Boarding Cattery is on the right hand side after one mile. If you pass a water tower on your left you have just passed us.